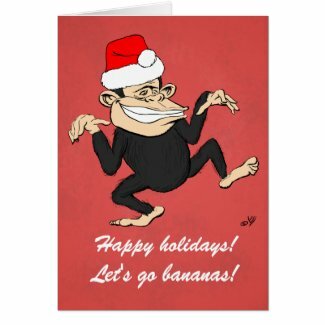 Here are some funny cartoon holiday cards designed by me, which can be bought on Zazzle. 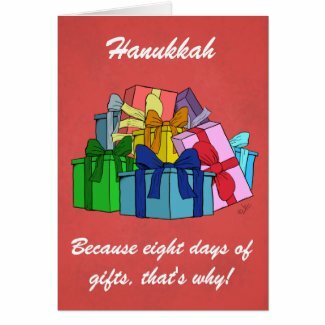 The designs include Christmas cards, Hanukkah cards, and Happy Holiday cards. Create unique personalized photo note cards from zazzle.com. 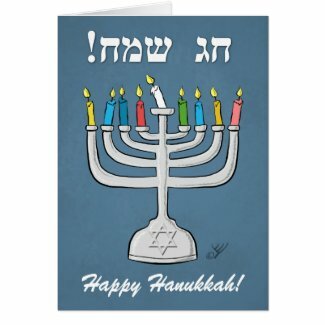 Make a card on zazzle. 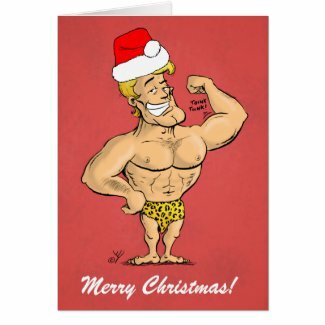 You can find more gifts designed by me on the C-Section Comics Zazzle Store. 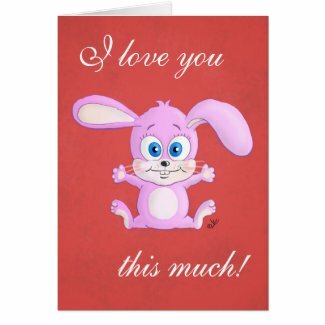 Be sure to check the Zazzle coupon section to see if any of the items are eligible for a discount. Zazzle.com is a print-on-demand service. Please note that Your Personal Cartoonist has no control over the delivery or quality of products ordered via Zazzle.com. Please read our terms of usage before ordering from Zazzle.com. 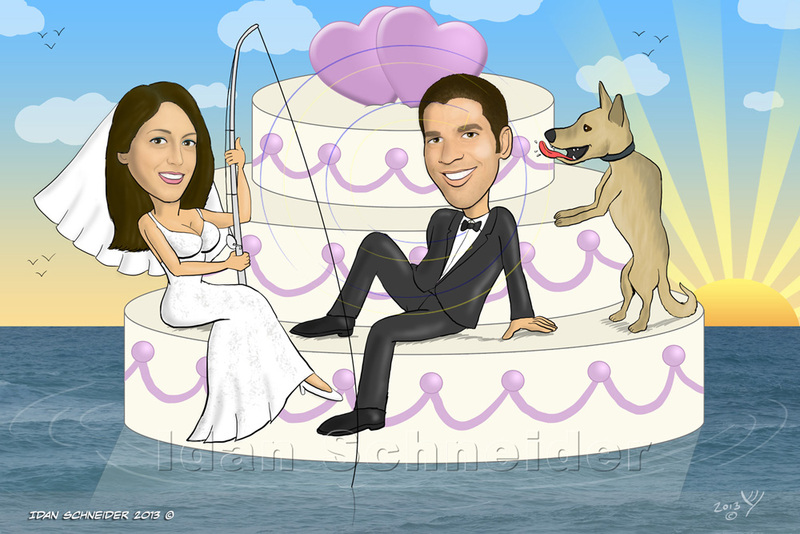 The caricature shows a surreal scene in which the bride, groom and their pet dog sit on top of a wedding cake, floating in the midst of the ocean. The bride, who loves to fish, holds a fishing pole. The dog, who apparently likes cake, licks the wedding cake’s topping, while the groom sits and smiles nonchalantly. The sun sets in the background. Do you want a caricature for your wedding invitation, save the date card, or engagement party invitation? I will draw a funny caricature for your wedding invite, in a similar style and in a setting of your choice. For additional details click here. 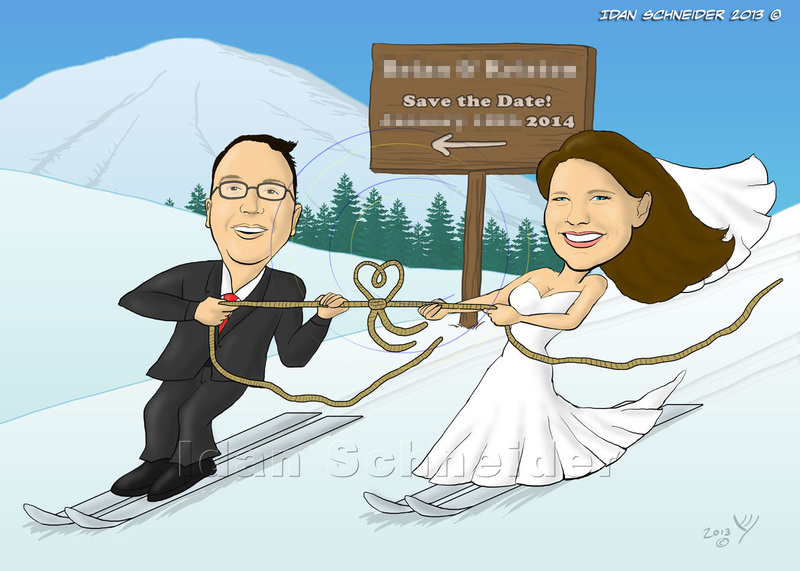 Since the bride and groom love skiing, they asked me to draw them skiing while holding a rope to “tie the knot”, the knot being heart-shaped. The bride and groom are dressed in their wedding attired, and the whole scene is taking place in a ski resort. Do you want a funny wedding invitation, save the date card, or engagement party invitation? 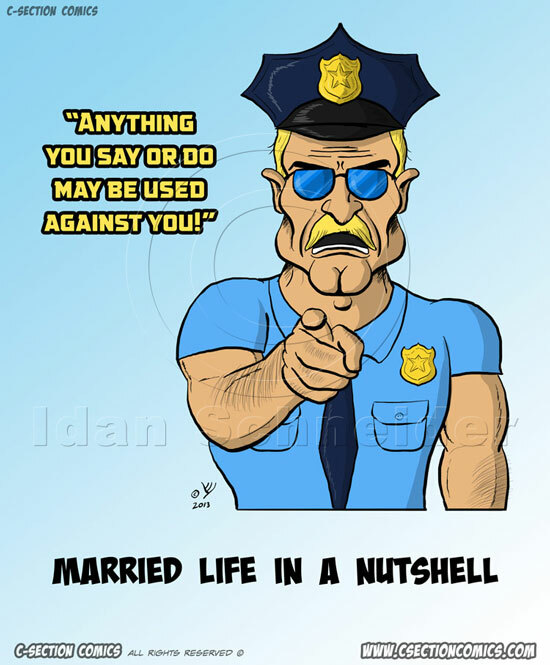 A funny wedding caricature will do the trick! I will gladly draw a funny caricature for your wedding, in a similar style, in a setting of your choice. Click here for additional details. This funny wedding caricature was requested by the bride’s sister – she wanted a funny caricature portraying the story of how her sister got engaged. The groom was wearing a funny T-shirt with the text “I mustache you a question”, and while they were preparing Pizza he showed her the new spatula he bought, with a “Will you marry me?” engraving. It’s one of the most original wedding proposal ideas I’ve heard of, and one of the most fun caricatures I’ve drawn to date. 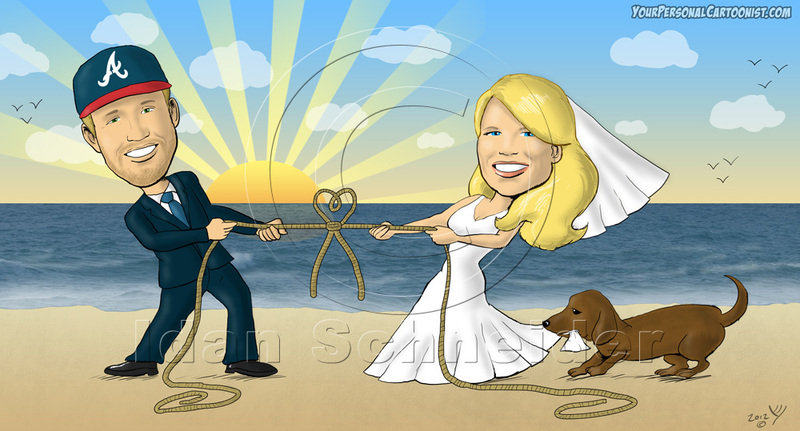 Would you like a similar wedding caricature of you showing your wedding proposal story? I’ll be happy to draw a funny caricature for your wedding, in a similar style, in a setting of your choice. You can use it for your wedding invitation, engagement party invitation, your shower or rehearsal dinner invitations, print it on a poster, or even use it to print it on your party favors. Click here for more information. Like this cartoon? Now you can buy the T-Shirt from Zazzle, or make your own custom T-Shirt with the angry cop. It’s a perfect gift for the groom, bride, or best man. 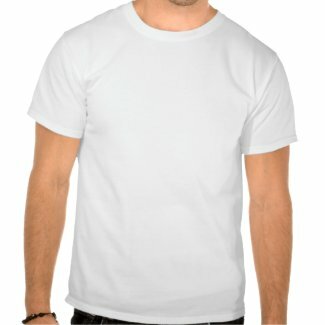 Zazzle.com is a print-on-demand service. 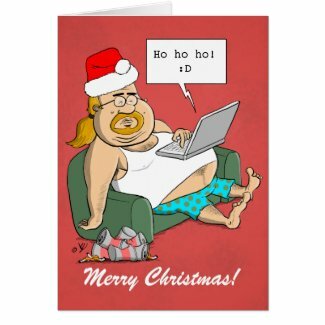 Please note that C-Section Comics has no control over the delivery or quality of products ordered via Zazzle.com. Please read our terms of usage before ordering from Zazzle.com. 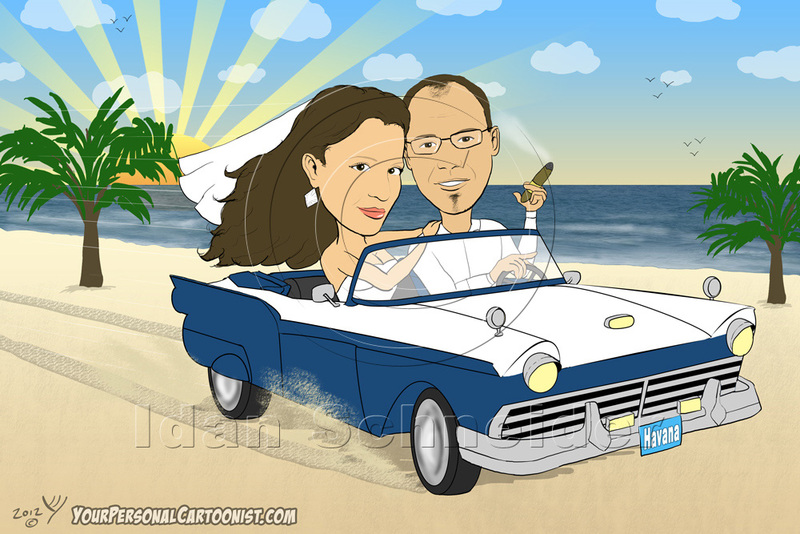 I drew this wedding caricature for a very nice couple that has a thing for antique cars. They told me they just returned from Cuba, where they saw their fair share of antique, Cuban style cars. They sent me some photos of the cars they saw and the beaches they visited, and I drew them dressed as bride and groom, in a Cuban palm beach setting, driving a Cuban style antique car. In order to give the caricature an additional Cuban atmosphere, I drew the groom holding a Cuban cigar in his hand. Ah, the good life! Would you like a similar wedding caricature of you, dressed as bride and groom? I’ll be happy to draw a funny caricature for your wedding, in a similar style, in a setting of your choice. You can use it for your wedding invitation, engagement party invitation, your shower or rehearsal dinner invitations, or even use it to print it on your party favors. Click here for more information. And here’s my special offer to you, for a limited time only – order a caricature for Halloween and get a 10% discount on your caricature. And if you’re a member of the C-Section Comics Facebook page, you get an additional 10% discount. That’s 20% off our regular price list! Offer is valid through October 24th. It may take several days to draw the caricature – so hurry up! Start by getting a quick price quote – Click Here! Please be sure to describe the caricature you’d like to draw as thoroughly as possible to get an exact price quote, based on our price list . Feel free to contact me now on any question you have! This personal caricature was ordered by the subject’s sister, to be given as a birthday gift. The caricature’s subject is a paramedic, so I drew her as a giant in paramedic uniform, holding a stethoscope, with tiny ambulances in the background. A personal caricature can be an excellent birthday gift. E-mail it as an online greeting card, or drop by your local gift shop and print it on a poster or t-shirt to be given as a gift! 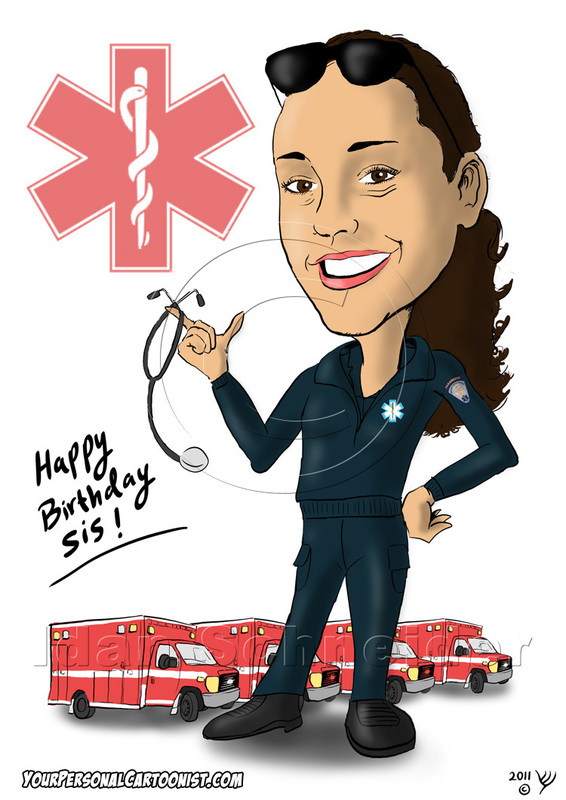 Would you like order a similar caricature as a gift for a friend or family member? I’ll gladly draw you a funny caricature from a photo, in a similar style, in a setting of your choice. Click here for more information. 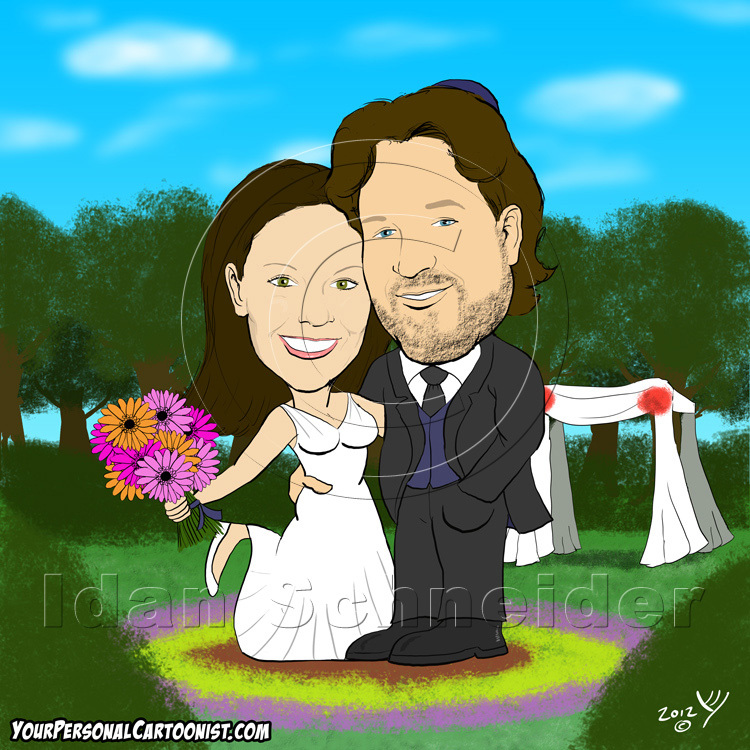 Another wedding invitation caricature that I drew in a Jewish theme. Since the wedding took place in a flower garden, the couple asked to be drawn in such a garden, with a Chuppah in the background (in Jewish tradition, a Chuppah is a canopy where the couple stands during the wedding ceremony). 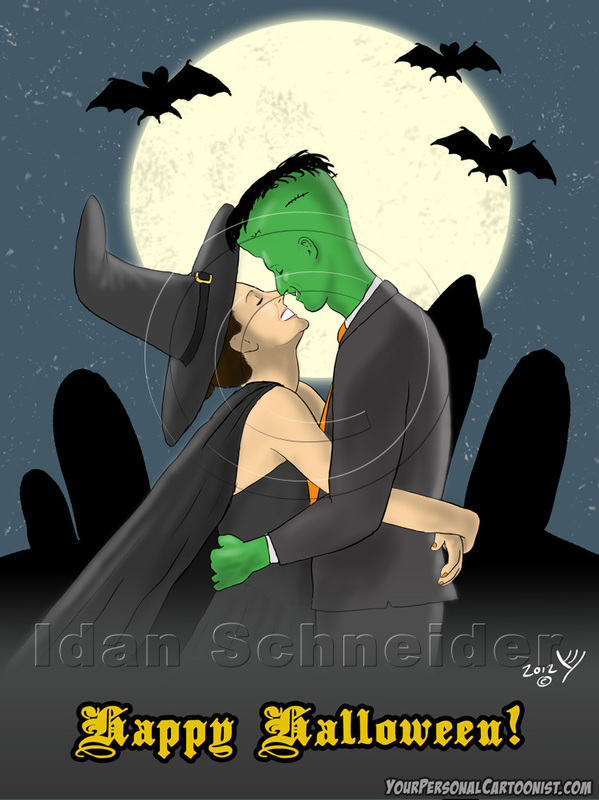 Would you like a similar wedding caricature for your wedding invitation, engagement party invitation, or something funny for your shower or rehearsal dinner invitations? I’ll be happy to draw a funny caricature for your wedding, in a similar style, in a setting of your choice. Click here for more information. This is a wedding caricature that I recently drew for a couple of Atlanta Braves fans (hence the baseball cap). The bride came up with the idea of drawing them in the middle of a Tug o’ War, the bride in her wedding dress and the groom in a suit and tie, while their pet dachshund is assisting the bride. Since the wedding took place in a yacht club, I drew them with a sunset background. The bride asked for the rope to be tied in a heart shaped knot, to symbolize that they are finally “tying the knot”. Would you like a similar caricature for your wedding invitation, engagement party invitation, or something fun for your showers or rehearsal dinner invitations? I’ll be happy to draw a caricature of you for your wedding, in a similar style, in a setting of your choice. Click here for additional details. Like our Facebook Page below and get a 10% Discount! My name is Idan, and cartooning is my passion. My cartoons have been featured in popular websites, the printed media, business presentations, academic papers, and even in an iPhone app! I also draw caricatures for wedding invitations, birthday invitations, Bar Mitzvah invitations, personal gifts, profile pictures and businesses. Like my style? Let me be your personal cartoonist! I'll draw your digital caricature (or anything else you request) from a photo, and you'll be surprised how affordable it is! 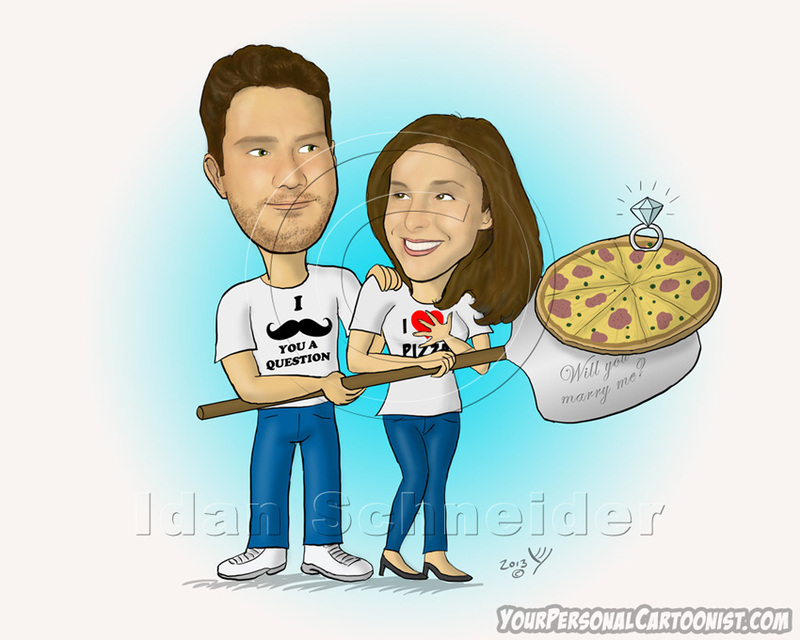 Your Personal Cartoonist features caricatures, cartoon and clipart created by Idan Schneider. The caricatures you see on this site are personlized and can be used for various purposes such as gifts, party invitations, party favors, Facebook avatars etc. You can order yours today. The clip art on the site can be licensed to be used for any purpose, perosnal or commerical. Be sure to also check C-Section Comics, my free online webcomic series. All artwork and content on this site is copyrighted © 2011-2012 Idan Schneider, and may not be used without written consent.